The AVK series earth terminal blocks meet the strict requirements for low contact resistance, corrosion-free connection points, secured screws, green and yellow colour coding and clear circuit identification. Since these terminal blocks are properly insulated, they can be positioned next to current carrying terminals. 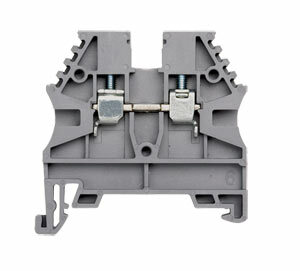 The earth terminal blocks are structurally designed to mechanically and electrically connect to mounting rails, when DIN rails are mounted to the metal cabinet or sub-panels and properly connected to earth, the proper earthing process is complete. 2 pc. Screw Connection Bridge, 10 per pkg. 3 pc. Screw Connection Bridge, 10 per pkg. 4 pc. Screw Connection Bridge, 10 per pkg. 10 pc. Screw Connection Bridge, 3per pkg. Nota: Standard colour is grey, red and blue are also stocked items. To order coloured terminal blocks add suffix “-R” for red, “-B” for blue, “-Y” for yellow, “-G” for green and “-BE” for beige, no additional cost. 2.5 per 20 A 5mm wide in 100 & 50 pcs. pkg. 4 per 30 A 6mm wide in 100 & 50 pcs. pkg. 6 per 50 A 8mm wide in 50 & 25 pcs. pkg. 10 per 65 A 10mm wide in 50 & 10 pcs. pkg. 16 per 85 A 12mm wide in 25 & 10 pcs. pkg. 35 per 115 A 16mm wide in 25 & 10 pcs. pkg. 70 per 175 A 22mm wide in 10 pcs & single pcs. pkg. Niente (lasciare il campo vuoto) per for a single pc.